Text adventures might seem like relics from the past, but then again, so are most vampires. Choice of the Vampire is yet another interactive fiction work from Choice of Games, and it delivers plenty of blood-sucking action in a rich and intrigue-filled setting around the time of the Civil War. With nary a sparkle in sight, CotV is a return to the old school, where lust and death reign supreme and sunlight can kill. Primarily set in and around New Orleans, the overall tone is definitely more Anne Rice than True Blood. Thanks to the occasionally long-winded and overwrought prose, the settings practically drip with broody elegance and historical context, but the colorful cast of characters and near constant political scheming also calls Vampire: The Masquerade heavily to mind, which is a good thing for this quasi-RPG experience. I say “quasi-RPG” because while CotV includes many, many different choices and paths for you to take along the way, the emphasis falls squarely on the storytelling, rather than gaming aspects. There are pages and pages of text where you are solely a spectator, but CotV is hugely epic in scale, so it’s more like reading through several completely different books. While vampires are naturally the primary focus of each storyline, how they each play out depends on you. Every path starts you off as a freshly-made vampire, but your initial choices have quite a large influence over your progress. For example, some plot twists may depend on you being able to read or understand French, which is easy for an educated French debutante, but will be difficult or impossible for to achieve if you start out as an illiterate, English-speaking field slave. But there are always choices available to you, and how you respond to them decides your fate. There are even a number of different goals that you can attempt to focus on, such as the redemption of your soul or discovering the origins of vampirism, which subtly shape your progress. Despite a general lack of interactivity, I mostly enjoyed working my way through CotV, but it’s not without a few flaws. The pages of text can get tedious from time to time, and there are a couple of minor bugs sprinkled throughout. My biggest issue was with the endings, which always feel far too abrupt, but, as with many Choice of Games, there is the promise of future chapters to be released, so hopefully that problem will resolve itself with time. 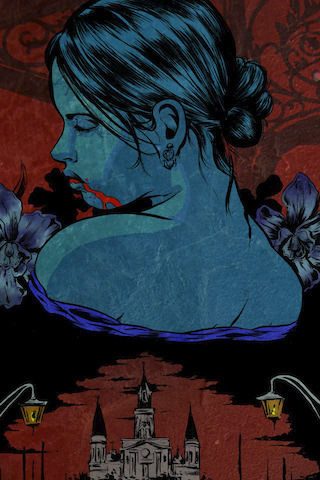 All in all, it was a pleasure to read about vampires with a little bite for a change, instead of toothless teenage fantasies, so if you’re the type who could use a little dark and dangerous text adventure fun, Choice of the Vampire should be right up your alley. AppSafari review of Choice of the Vampire was written by Tracy Yonemoto on October 7th, 2010 and categorized under Adventure, App Store, Books, Games, iPad apps, Puzzler, RPG, Strategy, Universal, Word Games. Page viewed 4878 times, 1 so far today. Need help on using these apps? Please read the Help Page.